Ingenuity and patience are two very important aspects of our work around the world. When you’re involved with a new heart program in a war torn or developing country, you must be able to think on your feet. You can’t expect the same equipment or help you would get in a well-developed hospital! 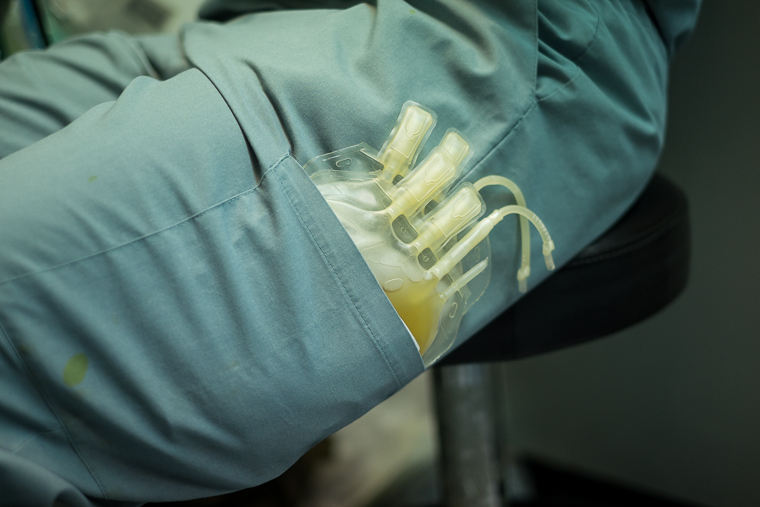 For example Sergey, our anesthesiologist, slips two bags into the pocket of his scrubs. A surgery is in process, and he is managing two bags of platelets. 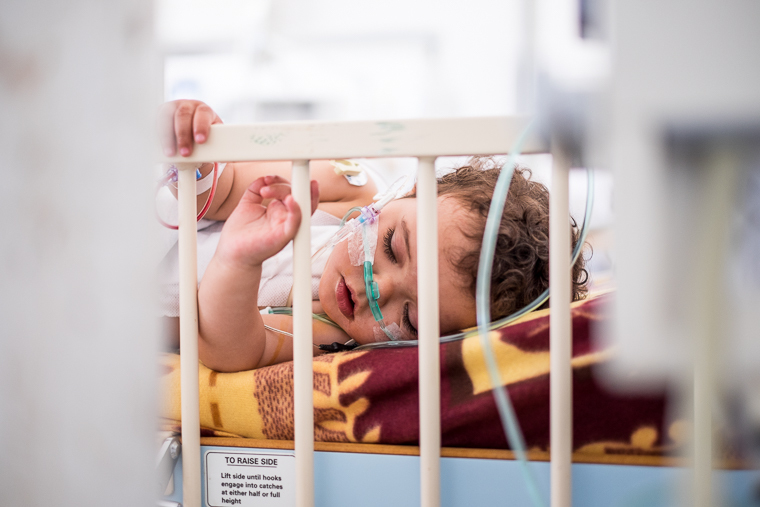 Typical western hospitals have a machine to keep the platelets warm and agitated, but the hospital here in Libya is far from a typical western hospital. So Sergey uses his body heat to keep the platelets warm and the constant movement between the operating table and his supply station keeps the bags agitated. Several key pieces of equipment we are using to operate are borrowed—from other hospitals, and from our own store of equipment in the US. And surgeries take longer when teaching local doctors and nurses, so our days are long. We continue to invest our knowledge and experience because they are keen to learn. David, our biomedical engineer, sent out for power strips when the ICU proved seriously short of outlets. 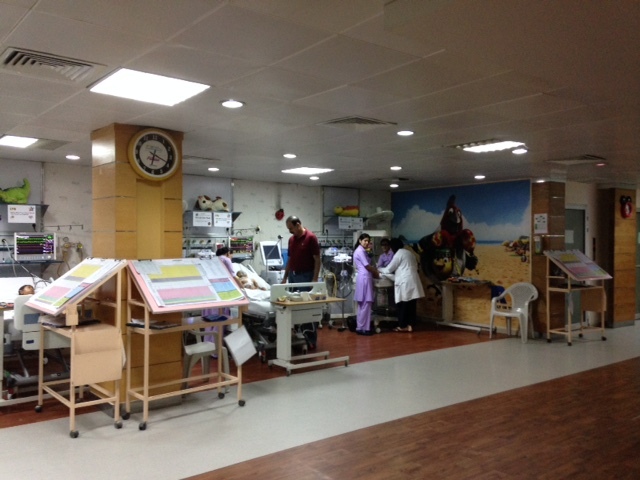 The ICU has become extremely hot and uncomfortable for our young patients. 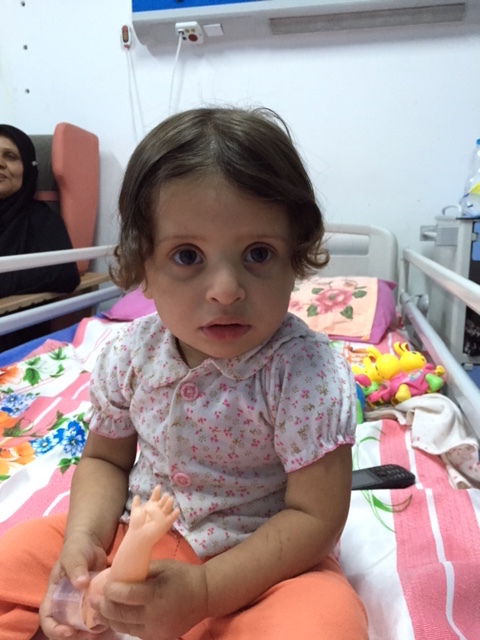 The mother of young Malak, a child now recovering from her recent heart surgery here in Libya, purchased an air conditioner for the unit. She and her daughter won’t benefit from the purchase since they’re headed home soon. But they did it for the other families still waiting their turn for surgery. And then there are the daily periods where there is no water in the hospital. It always comes back, but on dry days we have to use saline to wash patients. It would certainly be easier to work exclusively in more developed countries. But we choose to work where the needs are greatest. Some issues are expect, others aren’t, but the opportunity to save children and serve families makes it all worth it! Novick Cardiac Alliance PICU Nurse and Educator, Roslyn Rivera, BSN, RN remembers her experience with heart surgery as a child. 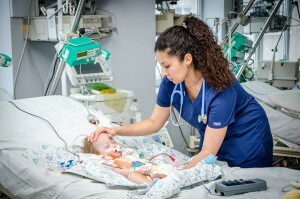 As a pediatric cardiac ICU nurse, I often find myself rocking crying babies just hours after their heart surgery, while I repeat the phrase “I know, I know…” in an attempt to calm them. I can honestly say I understand the pain and discomfort they feel with all the tubes and drains attached to their small bodies. I can say this, because I also have had open heart surgery to repair the congenital heart defects I was born with. My story starts on a warm Southern California summer day when I was born in 1983. 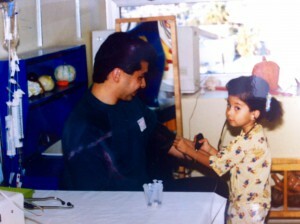 This was the day my parents learned that I had a heart murmur. I was born with a congenital heart defect called partial AV Canal. They were told the holes in my heart might close as I grew up, so surgery wasn’t necessary. But at the age of 3, I developed heart failure and had my first open heart surgery to repair my defect. 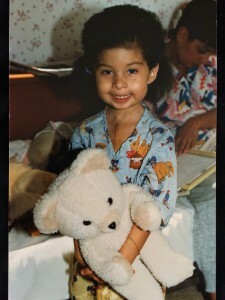 My only memories from this surgery were of the times when I went to the playroom! It’s safe to say this is when I had my first thoughts of being a nurse when I grew up… This idea was made definite when I was 10 years old and had my second heart surgery. 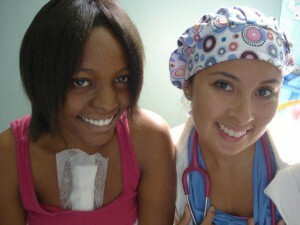 I noticed a faint scar on the chest of one of my nurses, and learned that she also had heart surgery. Hearing her story convinced me that I wanted to be in her shoes one day, as a nurse taking care of children after heart surgery. From my hospitalizations as a child, I never recall feeling afraid. I believe this is because my nurses were always so caring, and talked or played with me to distract me from anything painful. I remember my pacing wires being pulled out of my chest. I remember the expressions of worry and fear on my parents faces and the kind nurses who comforted them. I trusted my nurses, and these memories of being a patient reverberate into my own nursing career. I have never let my congenital heart defect hold me back in any way, in fact it has enhanced my life. I was fortunate enough to be born in a country where pediatric cardiac care was readily available, even in the early 1980s. This is why I travel to developing countries with medical teams providing heart surgery to children who would otherwise not receive care. 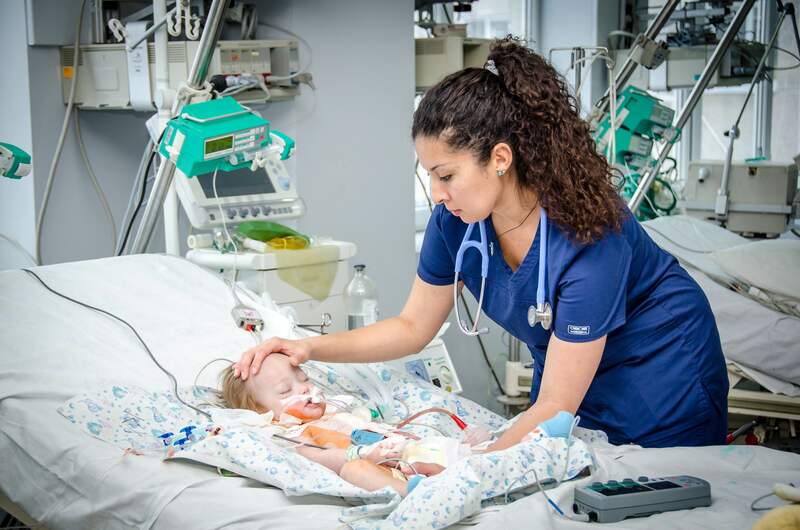 I was that child in the hospital bed attached to wires and tubes, and now—as a nurse—I can truly relate to the children I care for. 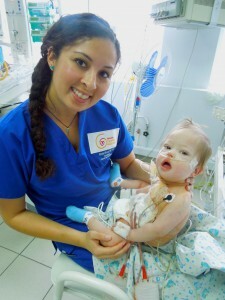 This has led me to continue my passion of helping children with heart disease in developing countries around the world. 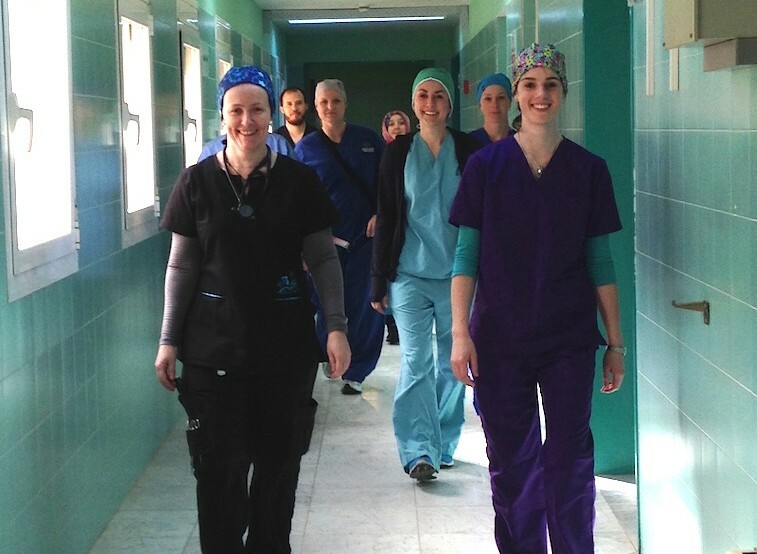 We’re well into our second surgical mission here in Libya, and things are moving steadily along. Take two minutes to hear an update on our work, straight from Dr. Novick. Brenda Kingsley is a mother who volunteers with Cardiac Alliance- here she shares her story with us. Mother’s Day is very special to me, I have been blessed with five children and each of them have changed my life greatly. 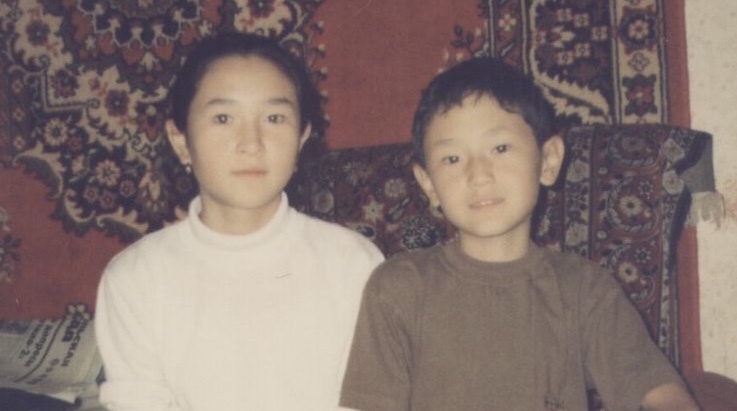 In 2004, I was pregnant with my fourth child and had gone in for a routine ultrasound. 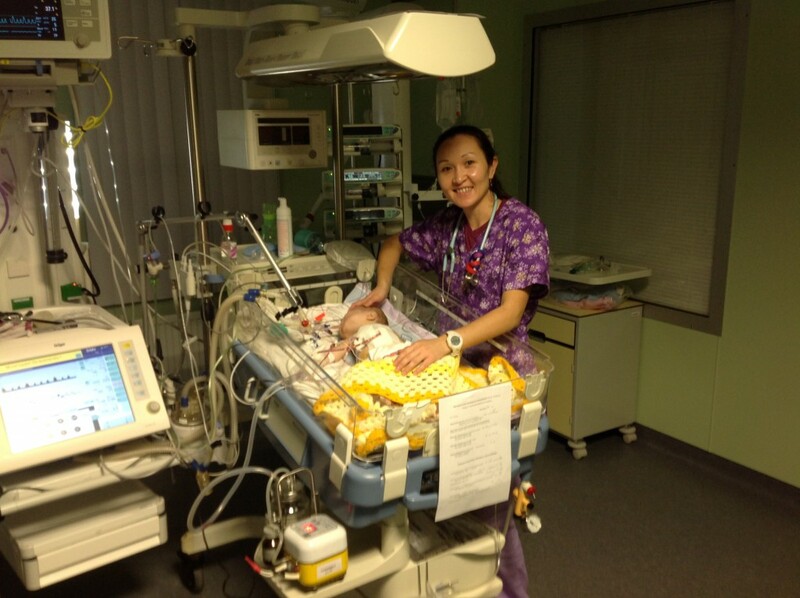 I was excited to see the baby, hear its heartbeat and find out whether it was a boy or girl. However, the news my husband and I received wasn’t the exciting news that I thought we’d get. We were told that there was something wrong with our baby’s heart; hearing that was devastating. At the time, we lived in Alaska and were told that our baby would need to be born in Oregon in order to get the medical care she would need. We of course wanted the best care for this baby; we’d go anywhere and do anything to make that happen. My daughter, Hannah, was born in Portland, Oregon at 35 ½ weeks. She had her first open heart surgery at 8 days old, had her second surgery at 6 months old and she had her third surgery at 4 years old. Our fear and anxiety grew with each surgery, not knowing if she would survive. 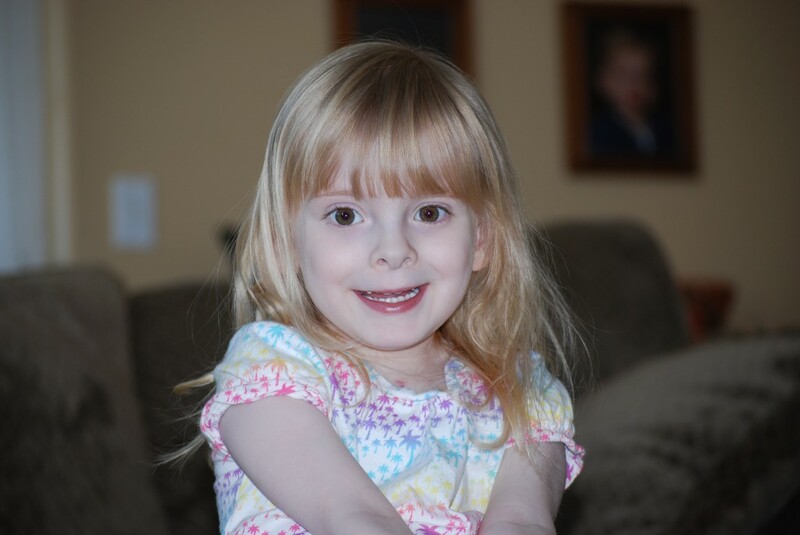 Hannah was so tiny and the surgeries she underwent were tremendous. Seeing her after surgery with all the tubes and wires was heartbreaking. When Hannah was a baby, she didn’t feed well, she slept more than the average healthy baby and she would turn a dusky blue color when she cried. As Hannah grew, she couldn’t keep up with the other kids her age, her face always had a blue tinge, she easily got sick and she was a lot smaller than other kids her age. Watching my daughter struggle to survive on a day to day basis was hard; I smiled like everything was fine, but on the inside I was dying. As a mom, my priority is to comfort my kids, protect them from as much as I can and whenever I see one of my children hurting, it hurts me down to my very core. I would do anything for my children, they are my world. Living in the United States, I was able to find the medical care that Hannah needed and I am so thankful for the doctors and nurses who took care of my baby. This was the best gift that anyone could have ever given me. As this Mother’s Day quickly approaches, I want to challenge you to think outside the typical Mother’s Day gift and give a gift of hope to a mother who doesn’t have the resources that I had for my child. 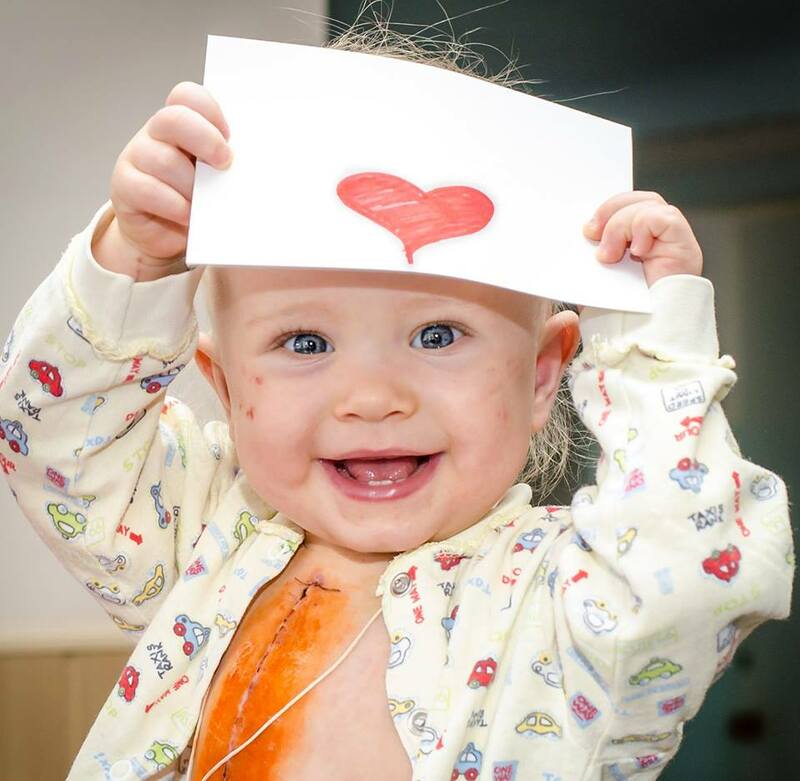 More than 90% of the world’s children born with congenital heart defects do not have access to life-saving care. 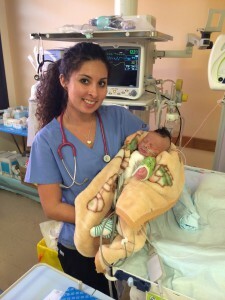 These mothers are unable to provide the care for their children as the financial burden of traveling to America or Western Europe for the proper medical care is more than they can bare and the local doctors do not have the proper training to care for the child. Imagine being a mom in an underprivileged country, watching your sweet baby struggle to survive and knowing that the proper medical care is not available. The pain and anguish of that must be unbearable. These are moms who love their children and want to give them the very best. Moms who want to see their kids grow up to be strong and healthy. This Mother’s Day, consider giving a mother hope. Hope that her child will get the medical care that they need. Imagine how life changing that hope would be to the mother, the family and to that precious child. Help us make this Mother’s Day truly special for many families around the world by supporting Novick Cardiac Alliance. Our team of highly trained doctors and nurses are working to establish pediatric cardiac care units all over the world, where many children can be properly diagnosed, treated and cared for after surgery. 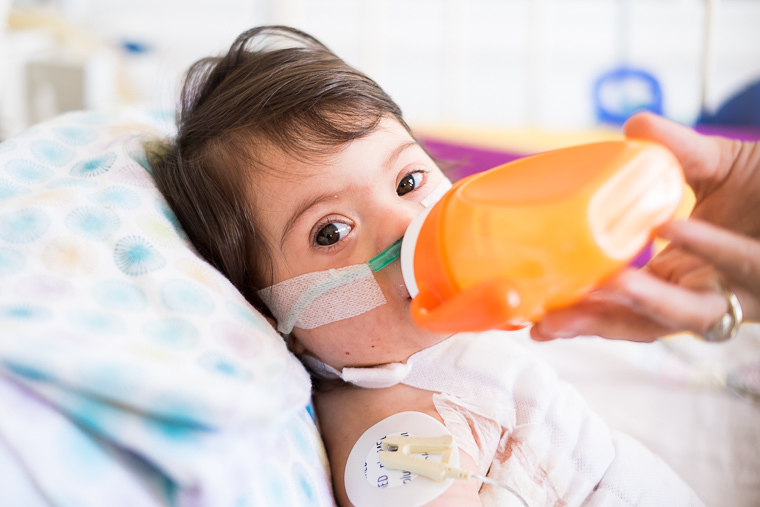 Your generous donations will make this life-saving care possible for many children. Do something special this Mother’s Day and give a gift of hope! Dilya Cleveland was 11 years old when she first met Dr Novick and his team – 20 years later she has shared her story with us. Although my surgery was performed in September 21, 1995, my mind holds strong memories and that experience will never be forgotten. I was visiting my local cardiologist since I can remember myself and I will never forget the day when my local doctor informed my parents and me that without the surgery I have only 6 months to live. It was July 1995. My parents were trying to gather money and possibly take me to Europe for the surgery, but financial situation was difficult and, honestly, I don’t think that it would’ve been possible. 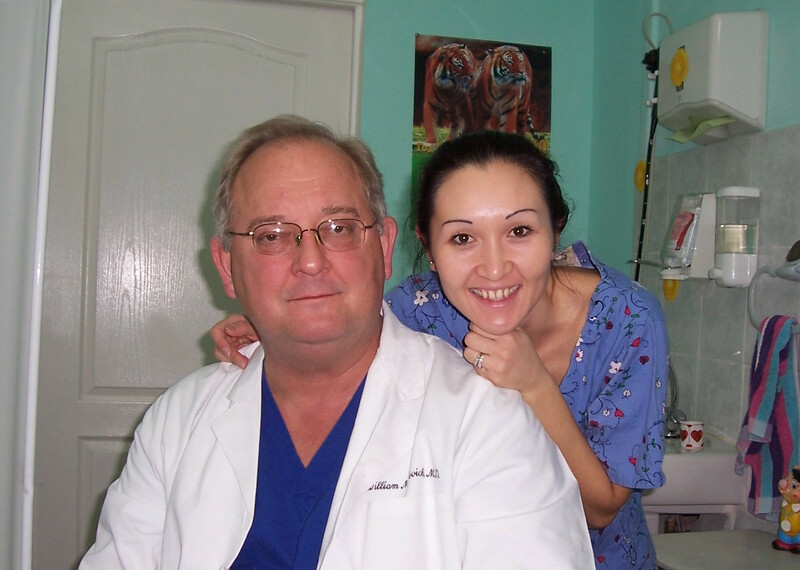 But God was looking over me and at the end of July my local cardiologist told us that the team of american doctors will be coming to Kazakhstan and performing free of charge cardiac surgeries. I was chosen to be one of their patients. My parents, all my relatives and I were absolutely thrilled with the news! Dr. No and his team arrived in beginning of September. I remember first time I saw Dr. No- he seemed so tall and his hands were so big compare to mine. 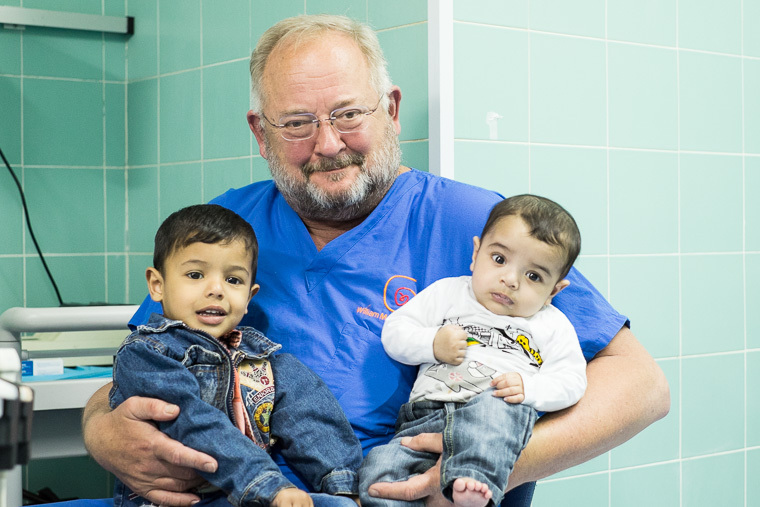 He came in to the ward to evaluate a little baby with TOF and I was wondered how can a man with big hands can perform surgeries on those little babies – it seemed magical and almost impossible to an eleven year old girl. Dr. No was a wizard. He made impossible possible. And not only in the eyes of a child, but also in the eyes of my parents. Till this day my mom remembers how Dr. Novick was reassuring her that I will be able to live a normal life and not to worry about my heart defect any longer. And he was right, he kept his promise! The surgery and the whole experience not only gave me a second chance in life, but also gave me a purpose in life and helped me choose my future career. 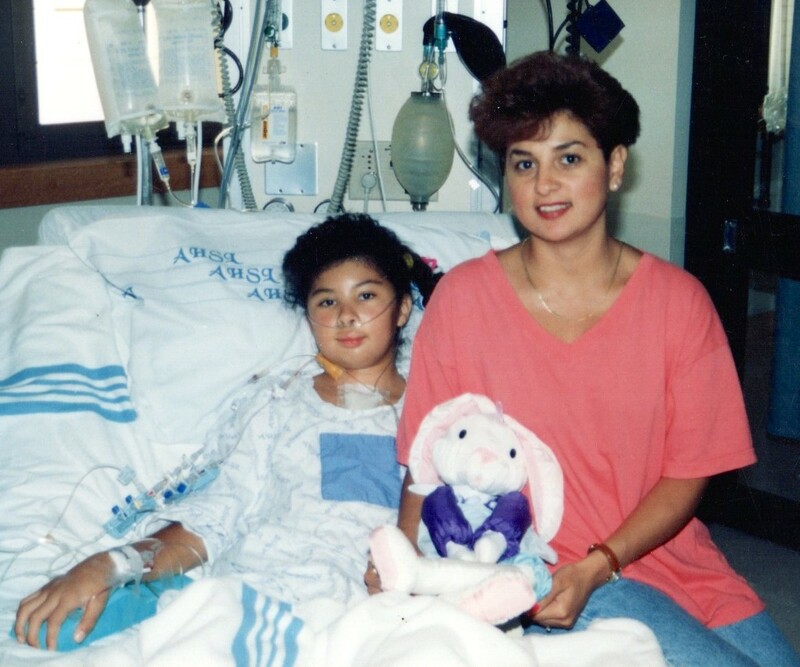 After the surgery I was interested in congenital heart defects, surgeries and medicine in general. Shortly after the surgery I started reading medical books and journals, and made a firm decision to pursue a career in the medical field. However, I had to walk different paths before I finally graduated as RN. Shortly after graduation I accepted a position as Peds ICU RN. 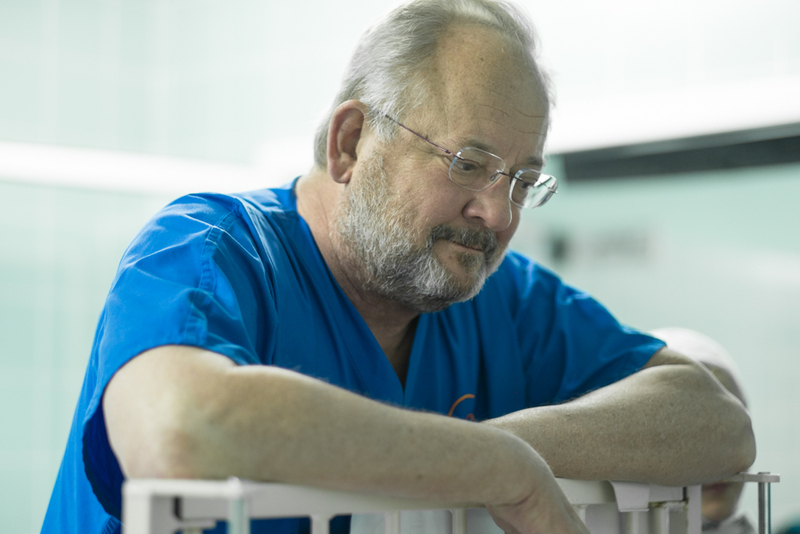 While I was in nursing school, God gave me another gift – the ability to reconnect with Dr. Novick and become a volunteer on his team. There will be never enough words to say thank you to Dr. Novick and his team for saving my life, the only way I can express my gratitude is to serve and help people in need through my job and volunteering. You can help too- Donate to Cardiac Alliance or Volunteer with us and help more children like Dilya become whatever they want to be! I am writing to introduce you to a new non-profit charity founded by me and those who wanted to further my dream to help children around the globe with congenital heart disease. After 22 years of operating on 7500 children in 32 countries with International Children’s Heart Foundation, a significant number of us have left and continued the original vision by founding the William Novick Global Cardiac Alliance (NCA). NCA was founded in October 2014 by 18 individuals who wanted to continue the mission of operating on children with heart disease, educating our colleagues in developing nations and above all helping to foster sustainable solutions to pediatric cardiac care. We are, by choice, non-sectarian in our approach so that all may receive care or volunteer to help. The necessity of founding NCA did not slow us down but encouraged us to continue to be better and to work harder to reach our goal. We have over 30 Cardiac Alliance trips scheduled for 2015 and will be adding more countries in coming years. We aim to provide comprehensive care to all children with congenital or acquired heart disease regardless of gender, ethnicity, religion, political ideation, genetic factors or economic means. YOU are our “heart”, the pumping force of our organization without YOU we would not be able to extend our services around the world. With this letter I am extending an invitation to all of you to join us in our endeavors to mend little hearts through volunteering, donating, or spreading the word in your community. 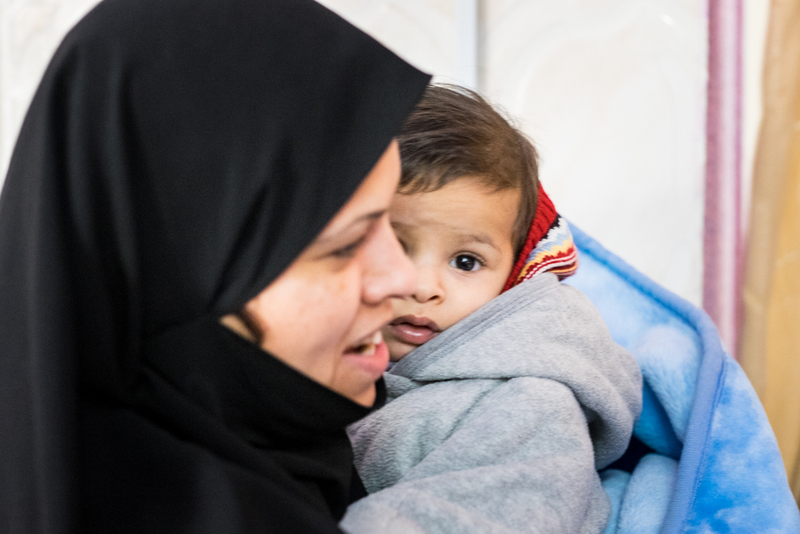 We had just begun our trip in Iraq and were in the ICU setting up and waiting for our very first patient when Dr Novick arrived with one of the cutest children we have ever seen. Her name is Hijar and she is one year old. Hijar was born with a hole between the top chambers of her heart and for most children this is a condition that will not need to be treated until adulthood. Hijar’s family knew she had a heart problem but that she could wait a few years before she needed an operation. 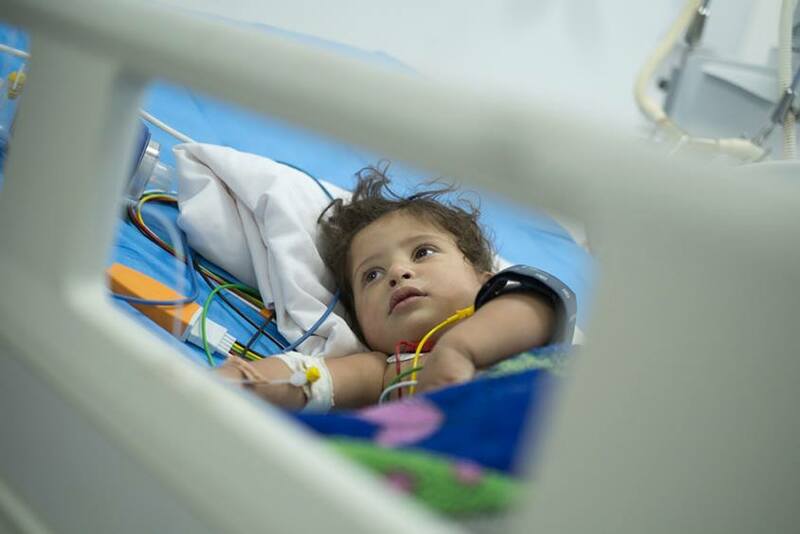 Then one morning Hijar’s mother noticed that her baby was ‘tired’ and not really moving much and then Hijar collapsed- her family rushed her to a hospital in Basra and found that her heart was beating very slowly and she needed an operation immediately to save her life. They were told to take her to Baghdad but with the fighting so near to that city the family were afraid and then someone told them that there was a foreign team of heart specialists in Nasiriyah who might help them. The family immediately drove the 3 hours south and asked the hospital to let them see the foreign team. Hijar was admitted straight to the ICU where we stabilised her and operated on her the same day- we inserted a pacemaker to increase her heart rate and while we were there we also fixed her other heart problem so she never had to have another operation again! 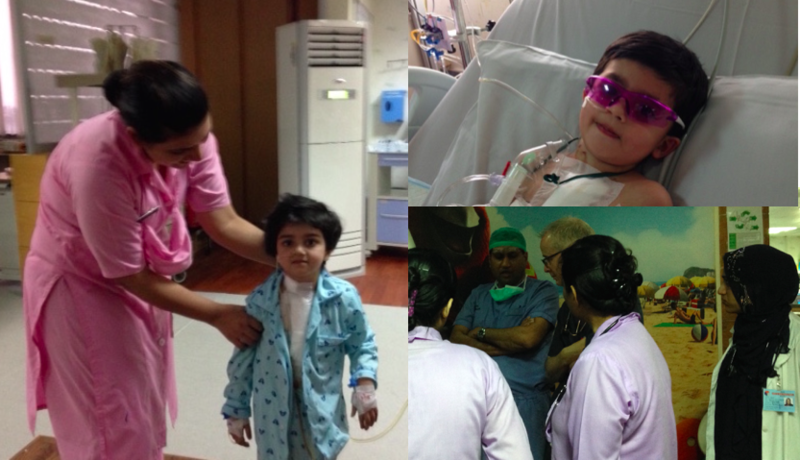 Hijar left the ICU the next day and went home with her parents just 3 days later. 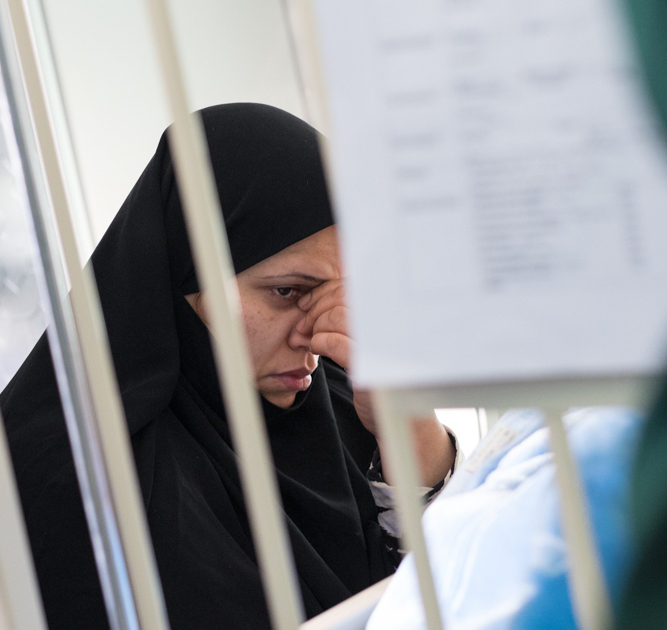 There is no hospital in the south of Iraq that is capable of operating on young children or babies independantly and for most families the idea of travelling North, nearer to the ISIS held areas is frightening. For Hijar this story has a happy ending but there are thousands of young children in Iraq who need our help. You can Help us to continue our work in Iraq and be in the right place at the right time for more children like Hijar. Donate today or Volunteer with us and change a life. In December 2005 Dr Novick and a team of professionals made the first of what would be 17 surgical trips to the Armed forces institute of Cardiology (AFIC) Rawalpindi, Pakistan. As with any new endeavor we had high hopes for this centre but none of us could have imagined what they would actually achieve. Within 2 years they had doubled the number of successful surgeries they were performing on children in their region and now – 10 years later – they offer a state of the art facility and standard of care that is comparable to institutions in Europe and the United States. Last year more than 700 children received treatment at this site and the team help to facilitate training to other hospitals in the region. This year Dr Novick’s team was invited back to work at AFIC as they want to improve the care they provide to more complex children. 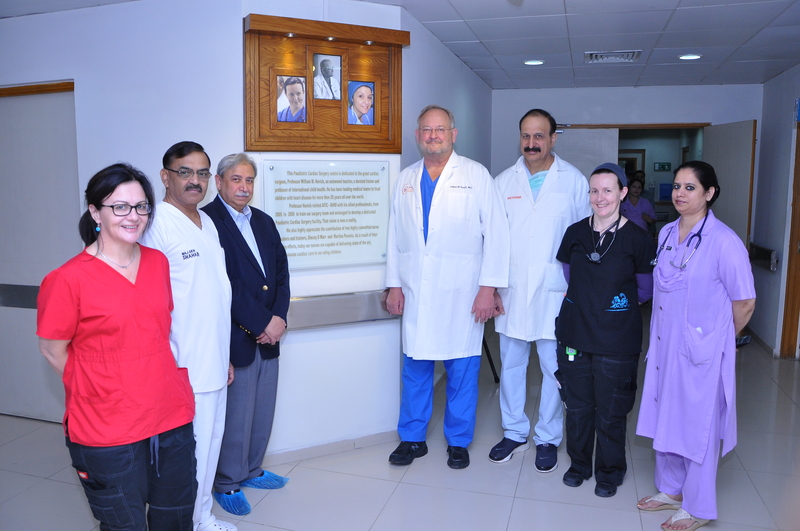 While we were there AFIC held a dedication ceremony for the new Pediatric Cardiac Surgery facility. 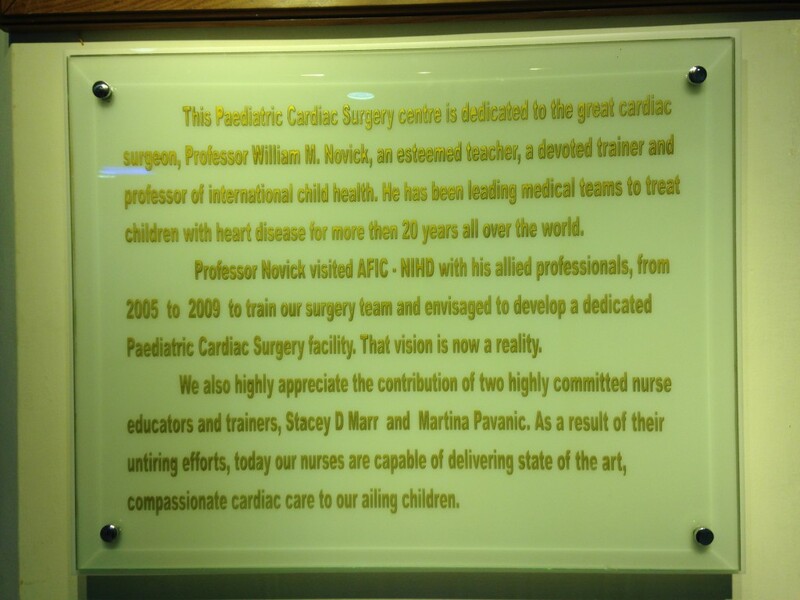 To our great surprise this facitlity was dedicated to Dr Novick- it was a very humbling experience for us all. Never in my wildest dreams did I think I would, have a pediatric cardiac surgical wing dedicated to me and my colleagues- at least not in my lifetime!!. Well it has happened! Our work in Pakistan was rewarded with just such a dedication. I remember drawing the plans on a napkin between cases with the Surgeon General of Pakistan in 2006 and now I am standing here! Thank you to all of our colleagues and friends at AFIC for this great honour it is humbling beyond words. Join us this year as we visit more new sites and continue to make Happy Hearts around the world.